Rather than being victims of police brutality, a new video shows that Occupiers at UC Davis knew they were going to be pepper sprayed and didn’t mind it. Indeed, the new video evidence indicates that the entire confrontation with the police was staged for the benefit of the media, which took the bait and ran with it, making police out to be cruel and heartless villains. According to press reports, the officer under attack in this case is a former Marine sergeant who defended his country and was defending the UC Davis campus from outside agitators. "Occupiers" blocking a sidewalk at UC Davis get pepper sprayed. The new video evidence demonstrates that the police had not only warned the protesters in advance about what was going to happen but one demonstrator says to the police, “You’re shooting us?” and, after getting an affirmative answer, replies, “That’s fine.” Another tells her comrades, “Keep your eyes closed.” Several are seen covering their faces. 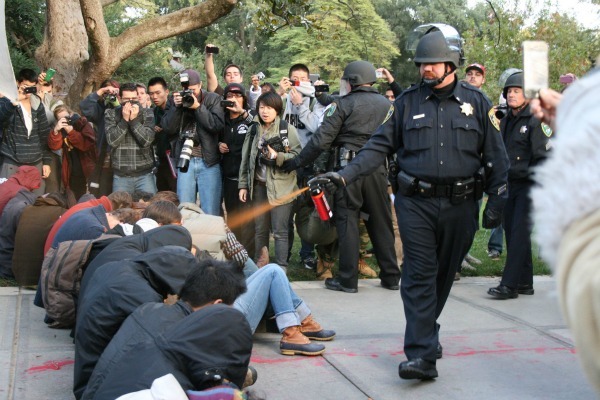 Despite misleading stories about the “peaceful protest” at UC Davis, the campus police had been ordered by Chancellor Linda Katehi to remove the protesters using pepper spray, determined to be the best way to do so without causing long-lasting physical injuries, because they had erected an illegal tent city on campus and were blocking a sidewalk. The police could have used batons, like they did during an earlier confrontation at UC Berkeley, but that was ruled out by the UC Davis campus police chief. The video shows the police holding and shaking the pepper spray canisters during a time period of several minutes. They gave the protesters more than enough time to disperse. The public deserve to be educated by the media about what is really going on here. The so-called Occupy movement, underway for several months now, is based on seizing public and private property. Since the public has demanded that the protesters be evicted from these spaces, and many mayors are ordering the police to do so, the leaders have decided to move on to college campuses. UC Berkeley and UC Davis were some of the first targets. The effort to discredit the police is an old Marxist tactic, designed to lay the groundwork for larger mob actions. Congressional investigations were held in the 1960s into how communists foment riots and disturbances. The aim is to demonize and then paralyze the police. Since members of the Democratic Socialists of America have discussed plans to take over city halls and state capitals in the next several months, we can see that the stakes are rising as the Occupy movement gets more violent and confrontational over time. This is the time to support the police, not undermine their ability to preserve law and order. What Kelly actually said was that it was a “derivative of actual pepper and a food product essentially.” She went on to say that the nature of the substance was “beside the point” because of its potential impact and that it was “abrasive and intrusive” to those getting exposed to it. So there was no effort to play down the nature of what happened. She pointed out that some of those exposed to the spray went to the hospital, although any injuries they may have suffered are a matter of dispute. The effects of pepper spray are usually temporary and can be washed away with water. The point of the pepper spray was to get the demonstrators, who had erected an illegal tent city on campus, to leave. They were interfering with the rights of students on campus to get an education and be safe while doing so. What the leftists really find offensive about Megyn Kelly’s comments is the fact that she defended the police, who used the pepper spray for the purpose of making it easier to remove the protesters. She noted that, from a legal standpoint, the cops can argue that they acted appropriately and did not use excessive force. Pepper spray was used to avoid a more physical confrontation with the people locked arm-in-arm on the sidewalk. Pepper spray is considered a more humanitarian way of dealing with lawbreakers. Batons could have been used as well. Kelly is being singled out because she defended the police, not because she noted the organic roots of pepper spray. In this regard, it is fascinating that so many modern-day “progressives” are on the side of the lawbreakers and not the police, many of whom are members of a public sector union. The police should take note of this. This should serve as a reminder that the police are the ones being victimized. Our media like to pretend they sympathize with those who defend our country, but those defending college campuses from unruly mobs are being sacrificed for a story line that justifies lawlessness and the takeover of institutions of higher learning. It is time for the facts to be told.